Adjust-A-Wall™ Curtain Wall Partition Systems provides protection and partitioning and easily rolls out of the way when not required. Workers painting, sanding, washing, welding, grinding, cutting, or assembling can work side-by-side to minimize contaminants from spreading into other areas. Custom systems to fit your specific application are readily available and can be supplied with clear vinyl windows for general shop and warehouse partitioning, or with tinted transparent vinyl for welding workstations. Select the height, width, and system configuration that best fit your needs. Widely used for wash bays, departmental workstations, storage areas, assembly lines, paint, primer, and prep areas, welding and grinding booths, and test labs. Combination curtains feature a 52" high clear or tinted (for welding) flame retardant transparent vinyl center section that starts 30" up from the bottom. The bottom and top sections are made of flame retardant vinyl laminated polyester, available in blue, green, yellow, white, red, black, or gray. 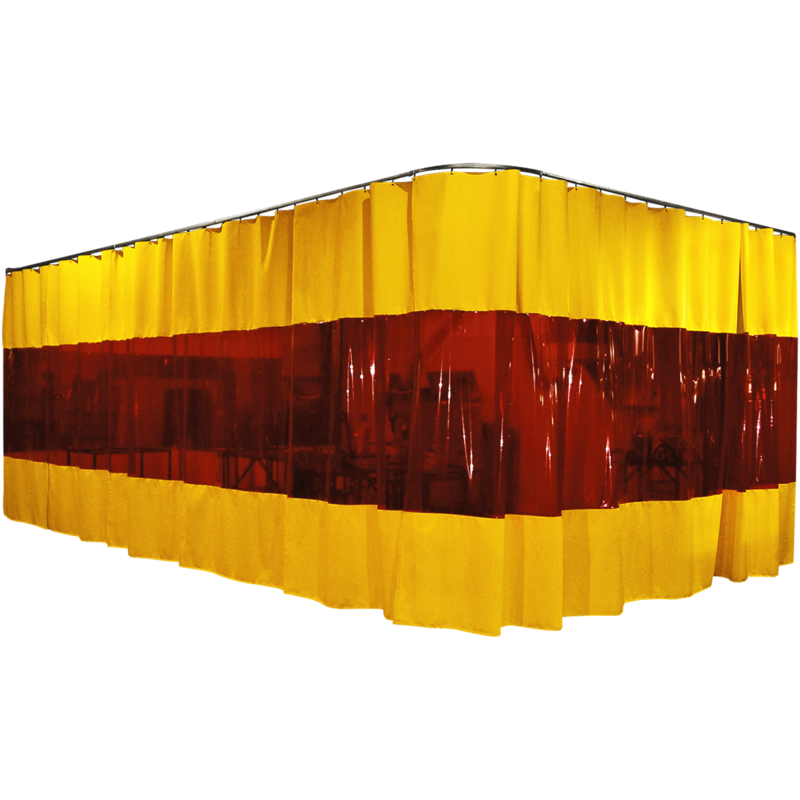 Vinyl strip curtains can be included in combination with your Adjust-A-Wall™ system. Determine Mounting Hardware - suspended, ceiling, wall or floor mount. Select curtain material and color combination (vinyl laminated polyester, tinted transparent, clear vinyl, or cotton duck). For material and color selection, refer to the Materials Available. Measure the required height (+/- 1" tolerance). Floors are not always leveled; take measurements from highest point of floor. Deduct 2" from height to allow for free movement of the curtain and prevent interference with the floor (to compensate for 1" track height and 1" hook length). Provide description of the system. Sketches are always helpful. Determine the total number of linear feet required (running length). Select the Part Number from the table. NOTE: Minimum 2" shall be deducted from curtain height to allow for the curtain to move freely. Normal tolerance is +/- 1". 10% is added to curtain width for proper drape. Adjust-A-Wall is easy to install, and Steiner’s technical team will determine and provide all the necessary connectors, track and hardware based on the installation mounting method and configuration chosen. The most popular method of erecting Adjust-A-Wall™ Partition Systems is suspension mount. Track is hung from overhead (beams or trusses) supported from chain, cable, threaded rod or angle iron (not provided). Upon installation of chain or other supports, the appropriate track connectors (chain or threaded rod type) are attached to track at approximate 4' – 8' intervals to suspend the track. Once track is suspended in place at height desired, roller-hooks are inserted into track slot (1 roller per foot of curtain). Close track slot by installing end stop at each end of track. Hang the partition by inserting hooks through brass grommets along top edge of curtain. Curtains should reach approximately 1" or more above floor for smooth and fluid movement. With this method of installation, the track is attached directly to the ceiling by mounting brackets flush to the ceiling, floor joists or to the bottom of a beam. For the Wall Mount installation method, track mounts are attached to walls above openings, or you can use wall end brackets to brace or stabilize the track. To install tracks using the Floor Mount installation method, you will need to erect custom-height columns attached to our heavy-duty 12" square floor bases, and install the appropriate track mounts to the top of each coumns..
Additional accessories and track pieces are available to completely customize your installation. Custom partitions can be ordered with hardware, or replacement curtains only.